(Written in 1894, by Robert P. Carr) The town of TAZEWELL is now about ninety years old. It has never grown to much magnitute, yet she has held her own and preserved a good name. In the history of CLAIBORNE County there has only been two hangings for murder. One about sixty years ago, the other about nineteen years ago. Before the war, it is said TAZEWELL was one of the finest little towns in East Tennessee, but during the war the town almost destroyed by fire, the court house and all other public buildings being entirely consumed. The town has gradually been rebuilt. The town has two splendid brick churches, built about the year 1844. Also a fine brick school building, where there has been a successful school for the past forty years. 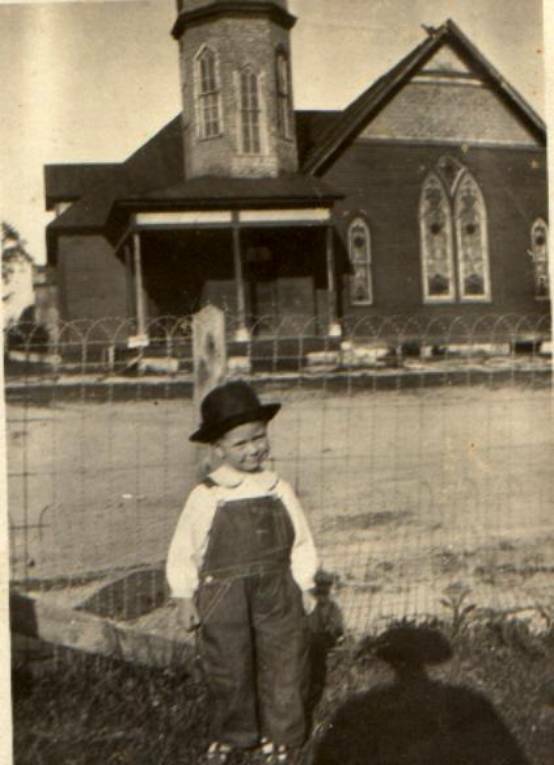 Dr. Gene McNeeley in his Tazewell History, 1938, says that the Methodist Episcopal Church was built 1844 and was located about one-fourth of a mile north of Russell Creek. The church collapsed and it was not until 1908 that a new church was erected on Main Street. He says the first Baptist Church in Tazewell was about five hundred years south Tazewell across Russell Creek and was built about 1850. This would put it far from where I think this picture was made. In the REFLECTIONS Winter/Summer Edition 2006 on page 3 are the minutes of the Ladies Aid Society for the Tazewell Methodist Episcopal Church dated, 1914. The minister was T.J. Crumley. Some of the members listed are it's president Bess O'Dell (Mrs. Andrew B. Wheeler), Mrs. John L. Buis, Margaret Stooksbury, Mrs. Nettie DeFoe and Eva Brewster, Mrs. Dona Livesay, Eva Stanifer, Moan Stanifer, Mrs. Minnie Ritchie, Mrs. Lizzie Nudlam, Mamie O'Dell, Ethel Mink, Ruth DeFoe, Lillie Crutchfield, Miss Della Buis, Miss Maria Ausmus, Honorary Members: Mr. Chas. Carr, T.J. Crumley, W.F. Brewster, J.P. Ritchie, A.J. Goin, John Wheeler, Henry Wheeler and Maynard Wheeler. The minutes are from March - Sept. 1914. From Holston Conference of Methodist Episcopal Church, Deceased Ministers, 1809-1905 we have the following - Kelly, John M. 1802-1856 Tazewell, TN.